GM Steve Keim considers Alford to be the Cardinals' starting cornerback opposite Patrick Peterson, Josh Weinfuss of ESPN.com reports. Alford signed a three-year contract with the Cardinals on Thursday, Kyle Odegard of the Cardinals' official site reports. Analysis: Alford was released by the Falcons on Tuesday as the team looked to create some extra cap space ahead of free agency. The 2013 second-round pick struggled a bit in 2018, recording no interceptions and posting his worst tackle numbers in four years. He'll enter his age-30 season in 2019 and will add to Arizona's secondary depth and could start at cornerback opposite Patrick Peterson. Alford was released by the Falcons on Tuesday, Mike Garafolo of NFL Network reports. 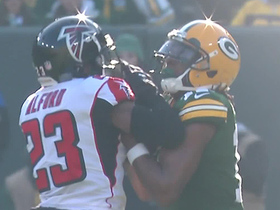 Analysis: The cornerback was due $8.5 million in the upcoming season, but Atlanta opted to let him go after he struggled a bit during the 2017 campaign. 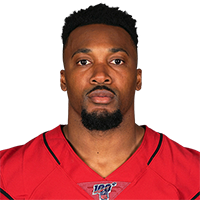 Alford recorded just 50 tackles last season -- his lowest mark since 2014 -- and failed to grab an interception for the first time as a pro. Most experts expect him to find a new landing spot fairly soon, though it's currently unclear as to where that will be. Alford collected five tackles during Sunday's 28-16 loss to the Browns. Alford (ankle) will suit up against the Browns on Sunday, Will McFadden of the Falcons' official site reports. Analysis: Alford was a full participant in Friday's practice after having been limited to begin the week. The starting cornerback will return to Atlanta's lineup after missing last week's win over the Redskins, and he'll attempt to contain Baker Mayfield and the Browns on Sunday. Alford (ankle) was a limited participant during Wednesday's practice, Vaughn McClure of ESPN.com reports. Alford (ankle) was ruled out for Sunday's game against the Redskins, Vaughn McClure of ESPN.com reports. Analysis: Alford wasn't able to participate at practice this week after playing through the injury Week 7, with the Falcons bye apparently not providing enough recovery time. Isaiah Oliver will make his second career start at cornerback in his absence, while Alford's streak of 46 straight starts will be snapped. Alford (ankle) did not participate in practice Thursday, Vaughn McClure of ESPN.com reports. Analysis: Alford was unable to partake in practice on his 30th birthday Thursday, casting doubt as to whether he will be able to extend his streak of 46 consecutive starts. Alford played through a bum ankle in Atlanta's Week 7 win over the Giants, but it remains to be seen if he'll active for Sunday's tilt against Washington. If the veteran cornerback is unable to go against Alex Smith and the Redskins' No. 26 passing attack, rookie Isaiah Oliver is slotted to make his second career start. Alford (ankle) did not participate in practice Wednesday, Will McFadden of the Falcons' official site reports. Analysis: Alford popped up on the injury report for Atlanta's Wednesday practice session, having closed out the Falcons' Week 7 game against the Giants playing through an injured ankle. If Alford is unable to give it a go Sunday against Alex Smith and Washington's 26th-ranked pass offense (212.7 yards per game), rookie Isaiah Oliver will see a significant increase in his defensive snap count percentage of 18.3. Alford had one tackle and zero pass deflections in Sunday's 43-37 loss to New Orleans. 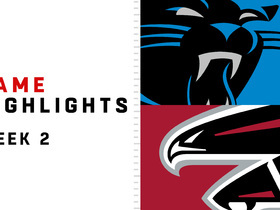 Analysis: The Falcons' No. 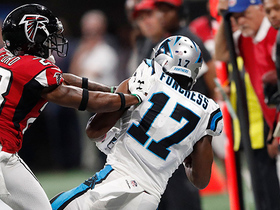 2 cornerback missed a goal-line tackle on Ted Ginn Jr. in the first quarter, resulting in the inaugural points of a classic NFC South shootout. Alford and the Atlanta secondary have allowed just 6.7 yards per attempt through Week 3, good for ninth-best in the NFL. 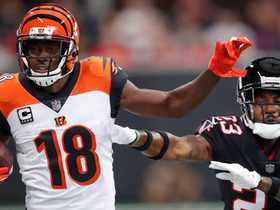 Week 4 brings Andy Dalton and Cincinnati's top-12 passing attack into Mercedes-Benz Stadium. Alford's 68 total tackles (60 solo) were a career high for the fifth-year defensive back. Analysis: He only had one interception this year, which is surprising considering he's had at least two interceptions in all four previous seasons. He's under contract for three more years, so he should continue to be a decent IDP option with 50 to 70 expected tackles and the chance at a couple of interceptions. Alford posted 10 tackles (seven solo) and three pass breakups Monday against the Seahawks. Analysis: Alford has only posted more than three tackles three times this season, so this type of performance is unlikely to continue. It's more that he was lined up against high-volume receivers and QB Russell Wilson, who heaved the ball up 42 times Monday. It was a great performance by Alford, but it's tough to predict when the next one will be. 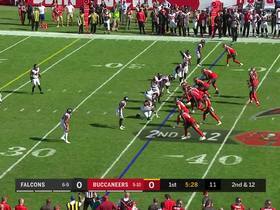 Tampa Bay Buccaneers quarterback Jameis Winston manipulates the pocket to connect with wide receiver Mike Evans. 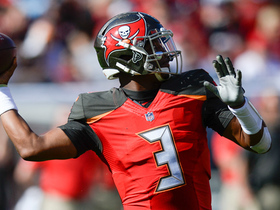 Tampa Bay Buccaneers wide receiver Chris Godwin snags Jameis Winston pass out air. Green Bay Packers quarterback Aaron Rodgers finds wide receiver Davante Adams for a 21-yard gain. 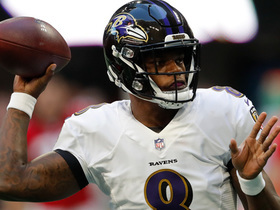 Baltimore Ravens quarterback Lamar Jackson throws to wide receiver Michael Crabtree for 18 yards. 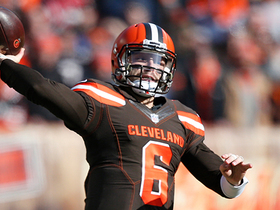 Cleveland Browns rookie quarterback Baker Mayfield's decisive throw to wide receiver Antonio Callaway goes for 25 yards. 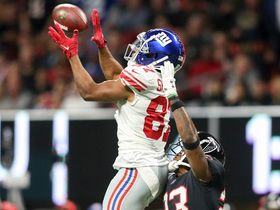 New York Giants quarterback Eli Manning throws a deep pass to New York Giants wide receiver Sterling Shepard for a 38-yard gain against the Atlanta Falcons for Week 7 of the 2018 season. Cincinnati Bengals quarterback Andy Dalton hits wide receiver A.J. Green for a 38-yard gain. 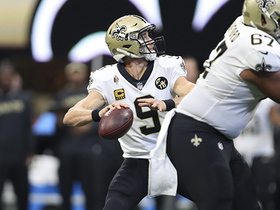 New Orleans Saints quarterback Drew Brees floats perfect pass to wide receiver Austin Carr for a 25-yard gain. The Atlanta Falcons get a balanced attack from quarterback Matt Ryan and running back Tevin Coleman to earn a 31-24 win over the Carolina Panthers in Week 2 of 2018. Carolina Panthers quarterback Cam Newton zips a pass to the sideline and it is caught by wide receiver Devin Funchess.